The statistics are shocking. A recent study from the Virginia Tech Transportation Institute found that a person texting while driving was 23.2 times more likely to be involved in a crash or near crash event. According to the National Highway Traffic Safety Administration (NHTSA), 448,000 people were injured in motor vehicle crashes involving distracted driving. An additional 5,474 people were killed due to distracted driving. One recent study found that driving “impairments associated with using a cell phone while driving can be as profound as those associated with driving with a blood alcohol level of 0.08%”, which just happens to be the legal limit in Georgia. The continued rise in accidents related to drivers using handheld electronic devices recently prompted the National Transportation Safety Board (NTSB) to recommend a nationwide ban on the use of all portable electronic devices (PEDs) while driving. While the NTSB does not have the power to enforce regulations, their recommendation is certainly influential. Currently, nine states ban all handheld mobile phone use. Even in states that ban the handheld use of mobile phones, drivers are allowed to use hands-free technology to make calls. This includes wired headsets, bluetooth headsets and bluetooth speakers. In Georgia, drivers under 18 cannot use a cell phone for any purpose while operating a vehicle. Moreover, Georgia has banned all drivers from texting while they are behind the wheel. This ban also includes using a portable electronic device to access the internet. All of the laws relating to cells phones in Georgia are primary, which means you can be stopped and ticketed for the violation, even without committing any other violation. Adults can still use both handheld and hands-free mobile phones to make voice calls. Despite the recent legislation by Georgia and many other states, accidents caused by portable electronic devices are on the rise. So what’s the answer? Will a nationwide ban on texting while driving make our roads more safe? Like the NTSB, we don’t have the power to make anyone do anything, but we’ve seen too many collisions caused by driver distraction to not at least try. We recommend leaving your cell phone off when you’re driving. If what you have to say is really that important, at least use a hands-free alternative (unless you’re under 18). One very good option is the FMV (For My Vehicle) On Star Mirror. The mirror allows you to pair your mobile phone to the bluetooth speaker in the mirror. You can make and receive calls using voice commands, which means your hands are on the wheel and your eyes are on the road. The mirror also provides turn by turn directions, alerts authorities in case you’re in an accident and can’t call 911 and allows police to track your vehicle in case it’s stolen. Like everything else “there’s an app for that”. 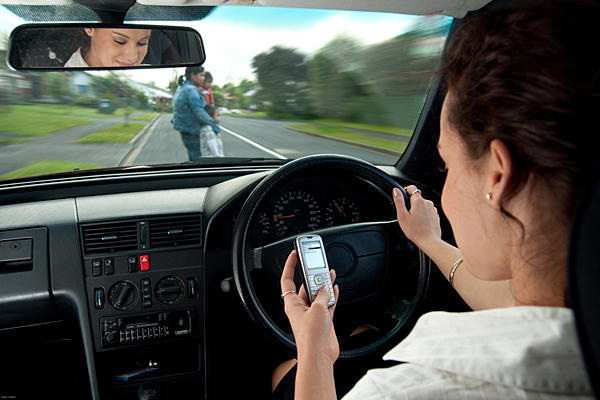 Atlanta based “Mobile Tattletale Applications” offers an app that aims to prevent texting while driving and speeding. It’s called “Mobile Tattletale” and is available for most major mobile operating systems. It uses the phone’s built in GPS to disable the texting and e-mail apps while the phone is moving above a predefined speed. The app can also be programmed to notify the parent if the car exceeds a certain speed or if the user tries to disable the functionality of the app. While it is designed for teenagers, it can certainly be used by anyone. As attorneys who represent victims involved in catastrophic automobile collisions, we’ve seen far too many people seriously injured as a result of cell phone use. Anytime someone suffers a significant injury in an automobile collision, it’s a tragedy. Yet it’s particularly sad when the injury is caused so needlessly. While the above recommendations might help prevent texting related collisions, the only way stop them completely is to put down the phone!